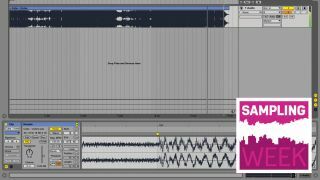 If you're unfamiliar with Ableton Live's approach to warping tracks to fit the project tempo, it might look intimidatingly complex, but in reality it's a very straightforward system that's extremely quick to use once you've got the hang of it. Here, we'll show you how to warp up a clip in three simple steps. This is useful because it means, once a track is slaved to Live's project tempo, we can adjust its tempo and pitch independently, and quickly select specific bars within the loop and edit them as we see fit. Step 1: Launch Ableton Live and press Tab to bring up the Arrangement view. Drag Cubs - Vortex.wav onto the start of an audio track, and Live will automatically warp the track. Step 2: Double-click the audio clip and zoom in on the end of the clip by dragging down on the timeline. You'll see that by the first beat of the track's final bar (193), Live's tempo detection has slipped out of sync. Double-click the transient above the waveform to create a warp marker. Step 3: Drag the warp marker to the right - it'll snap onto the start of the bar. The Segment bpm value in the clip view says the track is 130bpm, so set Live's Tempo to 130. Activate the metronome and play the track back - you'll hear that it's now sync'd up. For more on taking you sets to the next level with show-stopping re-edits, grab issue 298 of Future Music, which is on sale now. Includes interviews with Grimes, Pan-Pot and Dirty Vegas.